Down we went. Buttertubs drops 200m in a little over a mile, ending up just shy of Thwaite on the 'main' road through Swaledale. Left would take me north to Keld, even to Tan Hill, or west to Kirkby Stephen and Lancashire. Right took me to the Muker Tea Rooms, and though it was ahead of schedule for a stop, I like Muker and I thought that taking fuel on now would give it a chance to be assimilated over the next hour or so before the final climb of the day, the long scenic haul up from Reeth, past Grinton Lodge, over to Leyburn. Tea and a rhubarb and ginger slice outside in the sun.. and Patrick, you will be relieved to hear your name is no longer mud in Muker. 😉 A good turn deserves another, as they say, and I was glad of some proper good old Yorkshire hospitality here. 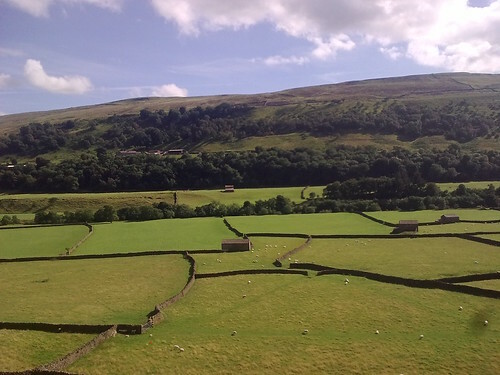 I left in high spirits – but then, with the views of Swaledale to contend with (surely the prettiest of all the Dales, though others run it close), who could fail to enjoy a run down the Dale to Reeth? Having said which, again I hope the peloton is spread out here – even without worrying about oncoming traffic, there's not much spare width on these roads, nor much warning of the swoops, twists and corners. Something that would trouble a Tour though makes pure heaven for the solo cyclist – or a small group. 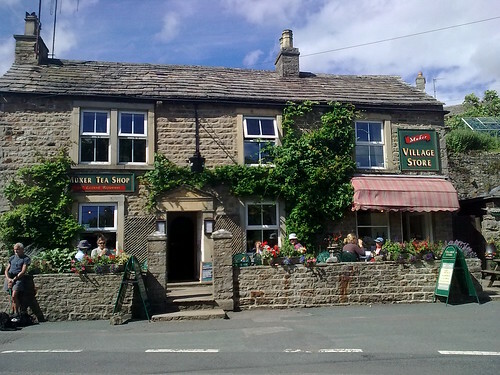 My stop at Muker did mean missing out on another recommended Swaledale cafe – the excellent, and comely, Copper Kettle in Reeth (there's a big triangular green with a big ol' slope to it. The Copper Kettle's just below its lowest corner.) It's small, and has no pretence of being Italian or Cordon Bleu, but that's not the sort of place I want to visit when I'm cycling. The Copper Kettle's done me proud when I've visited. But I wasn't stopping today. On we went, starting to climb as soon as we'd crossed the bridge and left the main road at Grinton. This is another excellent (read: challenging) climb, which changes character from the intimate, stone-walled and tree-lined savage lower reaches, to the gradual but unceasing bank past Grinton Lodge Hostel, to the sudden hairpin hook over the stone bridge at Cogden Gill (a place I'd like to stop and just dream for a while someday), to the unsettled, unsummitesque moorland stretch at the top in front of the MOD's Bellerby Ranges, that can't decide if it wants to plateau or bound along from brow to false brow. One major road to cross, then a last epic descent to reach the 100-mile mark at Leyburn. I celebrated by spending £2.03 on a bottle of Powerade, a banana and a cereal bar. 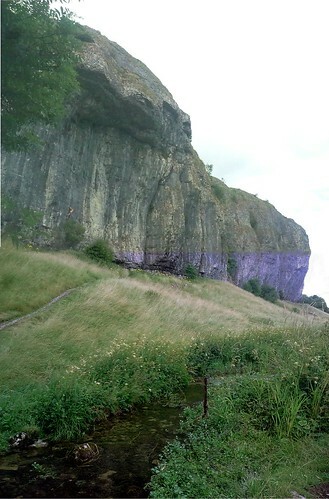 The freshly-surfaced climb past Grinton Lodge – Cogden Gill just out of sight. A marked change now in the ride's character, and surely that of next year's race, from here in. From now we're on A-roads, not flat but only rolling gently with the occasional rise, for the remaining 30 miles back to Harrogate. It seemed I had survived, and my grazing throughout the ride had left me with enough in reserve to smash my time targets for the rest of the ride, as I blasted through Masham and Ripon at my highest average speed of the whole ride. I realised that the wind had saved its favours until last, and was instantly glad that I'd had to struggle against it on the run to Skipton and to Hawes. If the result was two hours' wind-assisted bliss over a distance that I'd allotted three hours to cover, I couldn't have planned it better in my favour. I've derided this route before now as for an inclinophile like myself, the highly amenable countryside the road passes through just isn't hilly enough. 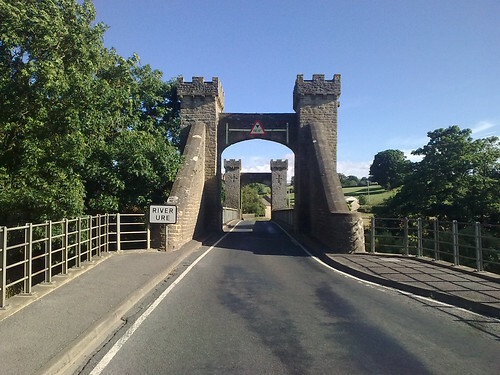 But then this was a ride I wasn't choosing to do myself, it had been chosen for me, and I had no complaints as I sailed through Middleham, East Witton, Jervaulx, Masham, West Tanfield, North Stainley and North Lees. Surely the elite riders next year will share that stamina and more, regardless of their earlier pace and their efforts in the hills, and this section will see some breathtaking average speeds. A few nadgety corners may cause the odd bottleneck at times, but it won't stop them for long. The few gentle hills between Ripon and Harrogate, and the climb up to Duchy in Harrogate itself, are the only noticeable blips in a pretty flat final hour or so's racing. I reached Harrogate at 8pm, though couldn't complete the First Stage's route in exact verisimilitude as it ends on the Stray up a wrong-way street – Parliament Street, known to all as 'The one with Betty's on'. Or this is what I believe – it's the most sensible place to have it, and gives a bit of excitement having a short steep uphill finish. I did find my way to Betty's though in case Kate, Tim and Adam were still around – it was their way of celebrating their ride, and I can only assume they managed it and dined in extravagant splendour before whizzing back to Leeds on the train. I hope so – their ride was a triumph of raw talent and youthful drive over caution, and therein lies a lesson for me. Not once did I need my pump, my bike tools, spares or lights, and only once did I lock my bike up – a lighter cable would have saved a kilo in weight. The Tour riders will be on bikes half the weight of mine, with all spares, food, maps carried separately – I fully expect them to manage the same distance in half the time, taking maybe five hours for 120 miles (I reached 134), averaging 26mph to my 13, and with no rest stops either! I got home at 8.15, fully 14 hours and 20 minutes after leaving. For Le Tour's riders, this will not be an unduly taxing day. What is the route like? For you and me, a grand day out. It is challenging enough, to die for in scenery terms, and varied enough to be constantly inspiring. The hills are proper ones – if you're considering a ride of this length, you'll be their equal, but you'll need proper climbing gears. It is generally easy to follow, most of the junctions clearly-signed and on the chief route to the next destination – with a couple of exceptions. 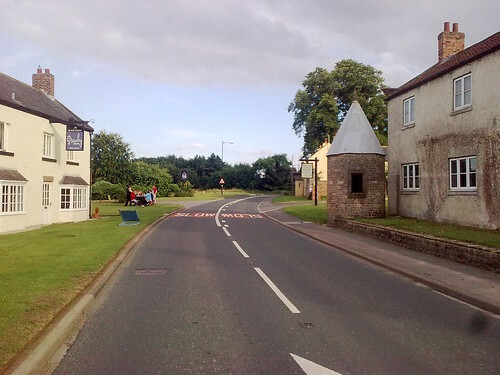 The road surfaces are largely fine, and where not they are rarely in critical areas – the odd rough surface on the way into Ripon or through Skipton, say, will trouble no-one, and I suspect that more resurfacing may take place before July! There are also few sections where traffic is a danger, as the narrower roads are in quieter areas and the busier ones are well-planned and wider. This is not to say that caution can be ignored and every descent can be a heart-in-the-mouth one – I was lucky that I was on the busiest roads (Leeds, Otley/Ilkley, the wide, smooth Ripon bypass) at some of the quietest times of a surprisingly quiet weekend – considering it was school holidays and unimprovable weather. And neither, actually, is it a route I would recommend, as it stands, for the solo rider or small group. But only because it has been chosen for the demands of the World's Greatest Cycle Race and all the capacity issues that raises. 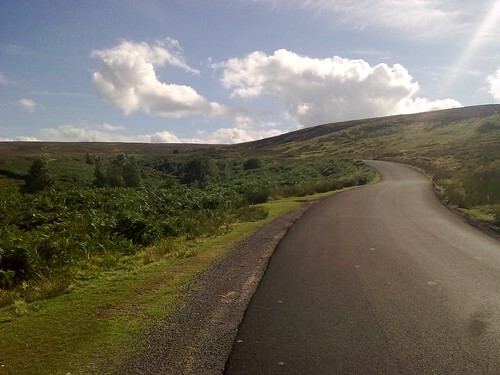 For myself, I'd avoid the smoothest major routes and take a few detours on other roads I've found more interesting – the other side of the Wharfe, and the Fleet Moss climb to Hawes, for example. That might need a bit more routeplanning however, but the overall ride is a fantastic one – you just shouldn't feel the need to stick to it that closely. If the coming of the Tour opens these roads to inquisitive, like-minded souls for whom the Dales and its charms are as yet unknown, then let us hope that they enjoy visiting enough to explore in more detail on further occasions. That, I hope, will be the true legacy of Le Tour's first Northern foray. And for the great, the elite, the riders? For them, the watching public, the teams and the infrastructure who will be following the route and the race in eleven months' time? No-one with a heart will be immune to Yorkshire's charms, and this first day route (and, for that matter, the second day's too – much of which I can also vouch for but more of which I need to explore for myself) really showcases much of the best Yorkshire can offer. It is absolutely the right route, the right place for Le Grand Depart 2014, and just maybe, some of those magnificent specimens of cycling perfection will sneak back in their civvies sometime and relive those rides – this time, for fun. For more details about Le Tour, and the route on this and subsequent days, visit the Official Tour De France Yorkshire site – I'm sure it will be regularly and cumulatively updated between now and Le Grand Depart in July. Thank you for reading! Now have a go yourself 😉 – if I can do it, you should be able to! NB. All photos the author's own, aside from the picture of Leeds Town Hall shared under licence from Wikimedia Commons. For the full terms of the licence, please visit Wikipedia's Leeds Town Hall page (text reproduced below).